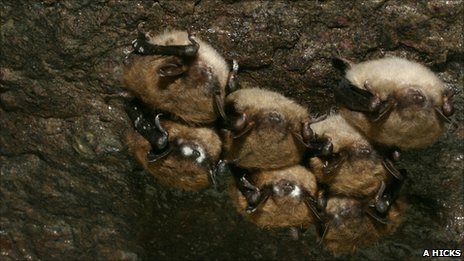 A disease known as white-nose syndrome has killed approximately one million little brown bats (Myotis lucifugus) in North America, say scientists. The research team report in the journal Science that this could drive the species to extinction in the north-eastern US in as little as 16 years.They examined 17 years’ worth of data gathered from bat colonies. A fungus associated with the disease was probably brought by humans into the caves where bats hibernate. This Geomyces destructans fungus appears to thrive in the dark, damp conditions in these caves, where it grows on the bats’ noses, wings and ears. Infection makes bats restless during the winter, causing them to stir when they should be hibernating and to use up their fat reserves. Once infection takes hold in a hibernating colony it kills, on average, 73% of the animals, the scientists have calculated. “We went in to some caves and couldn’t step on the floor because it was littered with dead bats,” Thomas Kunz from Boston University told BBC News. Dr Kunz led the team that undertook the study. He explained that the disease was first discovered in a commercial cave in New York state in 2006. This cave was frequently visited by tourists, which is why scientists believe that humans carried the first fungal spores into the cave. “Before white-nose, the population was stable, in fact populations were increasing slightly,” said Dr Kunz, “But when we plotted out the new data… it was pretty clear there was a massive die-off. The region in question encompasses Pennsylvania, New York state and New England, but the disease is quickly spreading beyond that area.